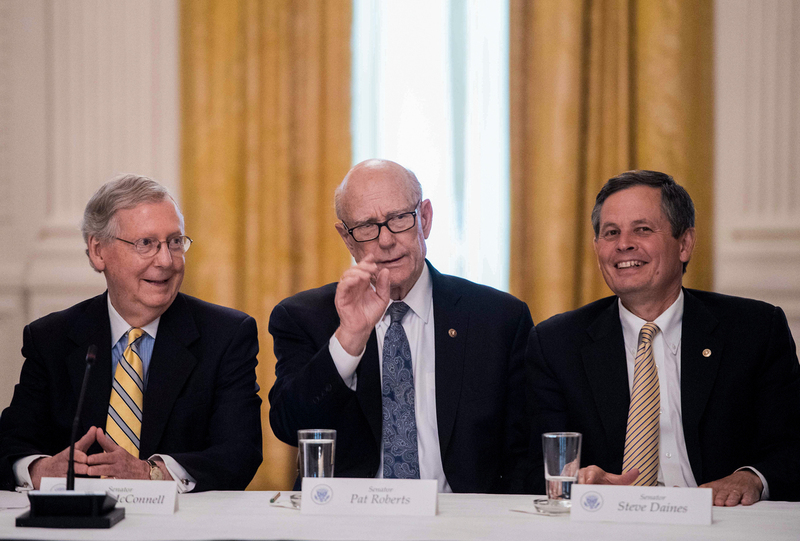 Steve Daines of Montana (right) talks with fellow Republican Sens. Mitch McConnell and Pat Roberts in a White House meeting in June on the GOP health care strategy, which would include deep cuts to Medicaid. Montana insurers say the plan worries them. Montana was one of the last states to expand Medicaid, and its Obamacare marketplace is doing pretty well. It has 50,000 customers, decent competition and no places that have come to be called "bare counties" — where no insurers want to sell plans. Still, the three insurers selling in Montana now say that if GOP plans to cut Medicaid and repeal the individual mandate go through, it will mean higher costs all around. The Republicans who make up two-thirds of Montana's congressional delegation say a big reason they want to repeal the current health care law is because it's causing health insurance markets to "collapse." But the insurance companies that sell policies in the state say that's not true in Montana — and they are concerned about what the Republicans are saying and doing. "I don't think that [the GOP] plan is going to improve health care in the state of Montana," says Jerry Dworak, the CEO of Montana Health Co-Op. "I think just the opposite is going to happen. And I think — I really do think a lot of people are going to get hurt." The co-op is one of the three insurance companies that's been selling Montanans coverage on Healthcare.gov since the federal marketplace was created in 2013. Montana Health Co-Op has no plans to leave. However, collapse of the insurance market is a real possibility, Dworak and others say, if some of the GOP's wish list comes true. First, deep cuts to Medicaid would have ripple effects to everybody who has insurance. Todd Lovshin is a vice president at PacificSource Health Plans. He says Medicaid expansion means Montana hospitals are now getting paid for taking care of more than 70,000 Montanans who got Medicaid after the state expanded the program under the Affordable Care Act. "All of our hospitals have to take any patient that comes in, and serve them," Lovshin says. "That has to be paid somewhere. And if we're not paying that through Medicaid expansion, those costs have to be borne by someone — and so that will increase the overall cost of medical expenses." Hospitals have a legal obligation to examine and stabilize any patient who walks in their door, regardless of whether they have insurance. When hospitals see their unpaid bills stack up, Lovshin says, prices go up for everybody else; to stay afloat, insurers have to charge patients who have insurance more. John Doran agrees with that analysis. Doran is a vice president with Blue Cross and Blue Shield of Montana, the state's biggest insurer. Doran also says that problems would likely get worse if the individual mandate goes away. That's the requirement that each person have health insurance – a requirement that the Republican health care bills would do away with. "If there's no mandate, and there's no incentive for them to buy a health insurance plan, then maybe they won't," Doran says. And if that happens, he says, "the people who need health care the most, and typically have the highest health care costs, are the only ones who are in the marketplace. And that results in higher health care costs, and consequently higher premiums." In recent years, many Montanans have continued to see their insurance premiums rise, sometimes by more than 50 percent a year. Most people who buy plans on the federal marketplace get subsidies to help defray the cost, and the co-op's Jerry Dworak says he thinks prices are now starting to stabilize. If the health law isn't changed, he projects his company's premiums would only go up 5 percent in 2018.